I've had the opportunity to teach at MoMA's teen education program, In the Making, and I had absolutely the best time. Earlier today, MoMA's Assistant Director of Teen and Community Partnerships, Calder Zwicky, shot me an email indicating that they're currently fielding applications from current MFA students or recent college graduates for their Studio Teaching Apprenticeship Program. Don't sleep on this! 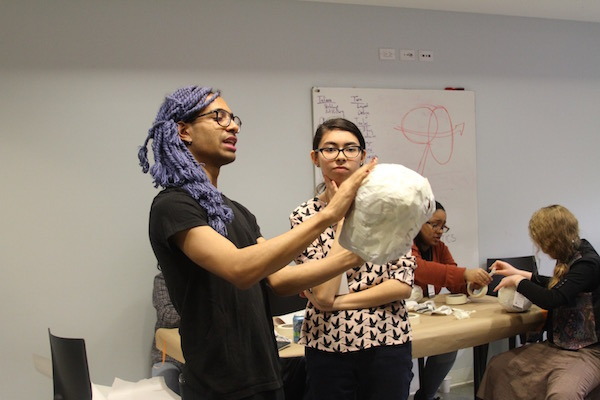 It's a paid, ten-week contract gig that gives artists interested in teaching hands-on experience working with MoMA Teaching Artists and NYC high school students. The student population is very diverse and represents all five boroughs. All accepted teens attend the program completely for free, and they get perks like Metro Cards, tons of snacks, and a big blowout exhibition at the end of their experience. The program runs February through April of 2018, and classes meet from 4:00-6:30pm on either Tuesday or Thursdays, depending with which Teaching Artist a Teaching Apprentice is matched. Applicants should be available for all ten class sessions and the stipend is $1900. According to the open call, duties may include: setting up art materials, working closely with students on various studio projects, documenting the class, assisting with the final exhibit install and deinstall, facilitating group discussions connected to MoMA’s Collections, assisting with some curriculum development, maintaining supply lists and cleanup, working closely with Museum educators, and participating in field trips. Send a resume along with a cover letter that addresses the following bullet points outlined below via email with the subject heading “Apprentice Educator Applicant” to Calder_Zwicky@moma.org by 11:59PM on October 26, 2017. How does the Teaching Apprentice Position with MoMA’s Teen Programs fit into your personal and professional goals? Describe what role you think museums and the arts can play in the lives of teens. What art forms, materials, or methods are you most drawn to, and why? If applicable, please include 2-3 digital images of sample artwork and a list of any exhibitions where the candidate’s work has been exhibited. I cannot recommend this experience highly enough! Please share this with any and all of your friends that you think would be a good fit. MoMA's In the Making is an incredibly special and life-changing program for scores of teens every season. If you've got questions about my experience, don't hesitate to email me: sean@humorandtheabject.com.